Drones for construction – it’s the most popular application of unmanned aerial vehicles, right behind aerial photography and videography. If you’re in the construction business, you know how important it is to make a great first impression when pitching to a client. In order to get their business, you need to clearly demonstrate your vision for their project and show them you’re capable of achieving that vision more effectively than your competition. This is where using drones fir construction can help set you apart in the bidding process. Using drones, you can survey proposed construction sites aerially, and use the footage to demonstrate the feasibility of your proposed plan for the project. Drones can be equipped with much more than cameras; they can also carry geo-location and infrared sensors, which can create visually striking 3D models of a construction site. This can help a client visualize areas of risk and reward for the project, and impress them with your technological expertise at the same time. Surveys are a vital part of a construction project, from pre-planning to completion. Aerial drone imagery, through video, lasers, and photography can help provide the most detailed and accurate land surveys using 2D and 3D maps. Surveys created by drones cover every possible angle and contain detailed site conditions that may be missed otherwise. When preparing a site before laying a foundation, the soil must be perfectly sculpted to the right grade and shape. Drones use lasers to daily scan the property to determine the readiness of the soil. The more accurate the project surveys, the more cost effective and efficient the construction project will be. Through the actual construction phase, drones can be used in many ways to increase the efficiency of project management and keep construction on schedule. Using drones for construction, you can track progress regularly, providing detailed progress reports. Drones can take daily assessments of project status, materials, and assets. If problems occur, drone video footage can provide a documented timeline of where the problem originated and how to rectify it through repair or design alterations. Drones also allow owners to view their property whenever they wish, providing them with knowledge and ease of mind about their project. Drone surveys can also be used to quickly and accurately demonstrate project progress in order to bill the client for the amount of the project that has been completed. Drones can provide consistent video security to a construction site, preventing intruders, theft, and other safety problems. Aerial imaging is also a much safer alternative to traditional inspections, as it keeps inspectors from having to personally walk through an unstable and possible hazardous construction site. Furthermore, drones equipped with thermal imaging can even detect dangers such as heat or gas leaks in the structure, or in the utility pipes underground. This is an amazing and little-known contribution of drones to construction projects. When you order construction materials like gravel, rock, sand, or concrete, it can be difficult to keep track of the amount of material remaining as the project continues. Automated aerial drones can fly over construction stockpiles and, within minutes, provide accurate volumetric measurements of the amount of material in stockpiles. Most drones can easily fly over 150 acres and measure up to 100 stockpiles, all within 30 minutes. This data is perfect for creating stockpile inventory reports and knowing when and how much to reorder construction materials. This helps keep a construction project on schedule by avoiding costly delays due to low materials, and keeps you on budget by avoiding over-ordering. 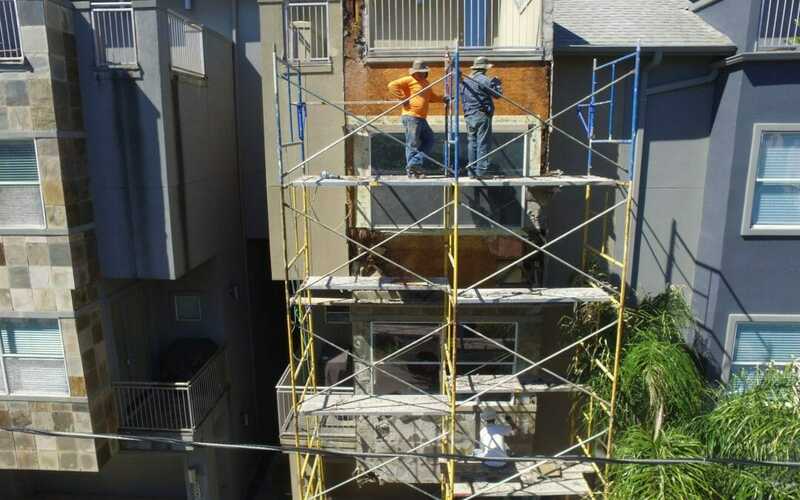 Inspections are a somewhat inconvenient yet necessary part of any construction project. Using drones for construction, however, helps inspections go more smoothly by providing a thorough overview of your project, so you can take care of any issues before inspections occur. Aerial imagery can also help inspectors accomplish a safer, more accurate, more efficient inspection, which will speed up your construction project and get you the “green light” to continue more quickly. One common question about using drones for construction projects is whether drones should be bought and used in-house, or whether drone flights should be outsourced to a company that specializes in drone use. Drones are now more affordable than ever; however, that doesn’t necessarily mean that purchasing and using a drone yourself will be the best choice for your project in the long run. There is much more to drone use than just the initial purchase; there are also additional parts, usage, and maintenance that will be needed. An employee would likely need to be trained to operate and maintain the drone, as well as to decipher and transfer its data into a usable form. If you aren’t able to fully utilize your drone for the purposes you need, then the drone won’t fully be worth the cost. We recommend hiring out your construction project drone needs to a professional, experienced drone company. Professional Drone Services of Texas is an expert in the latest aerial drone technology. We can help you finish your construction project in the most efficient way possible with real-time project tracking, progress reports, detailed surveys, and more. Along with regular video and photography, our quality drones and experienced operators can perform laser mapping, nighttime aerial photography, thermal and near-infrared imaging, and volumetric scans. Contact Professional Drone Services of Texas today to see how we can help you streamline your construction project.